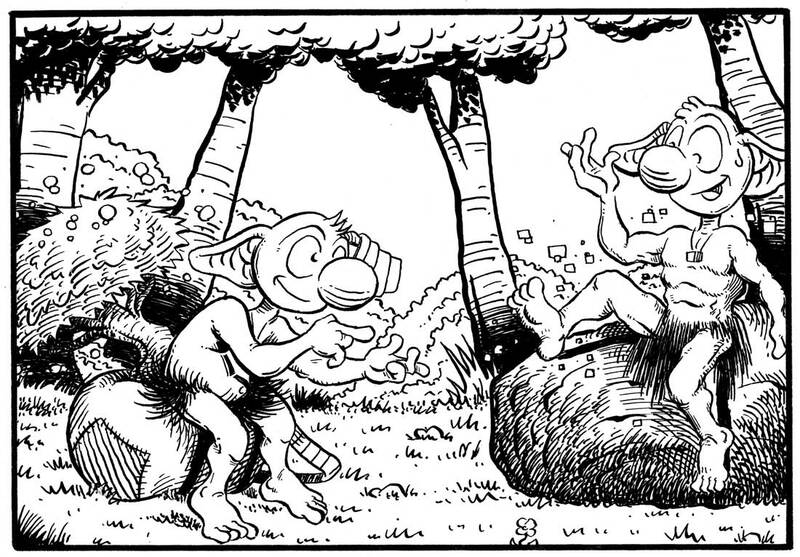 One of the comments I heard from people who read the first two issues of Farlaine was "Are there other goblins?". Yes, of course there are, and in issue #3 he runs into his first one - a rock goblin. This character was a direct ode to Obelix, Asterix's good friend in the French comic. He always walked around carrying a huge rock and to me that fit nicely with Farlaine carrying his tree. So the rock goblin makes a brief appearance in issue #3. At first I considered making him quite different looking from Farlaine, but then decided that they should be similar enough to notice they're both goblins. So the main difference was a slightly different haircut, a different necklace, a straighter grass skirt, and a lot more muscle. After all, a rock is a lot heavier to carry than a tree, right?